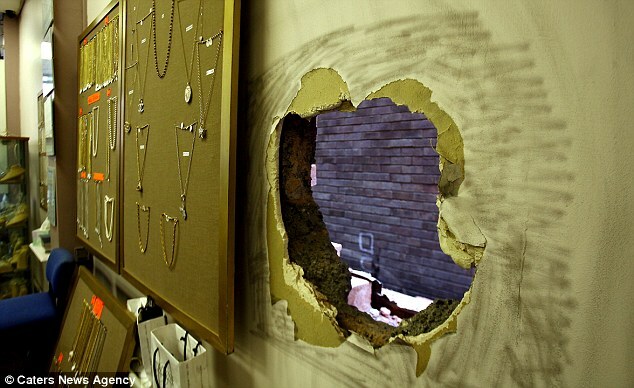 A thief spent more than three hours smashing his way through a brick wall before carrying out a £30,000 raid on a jewellers. 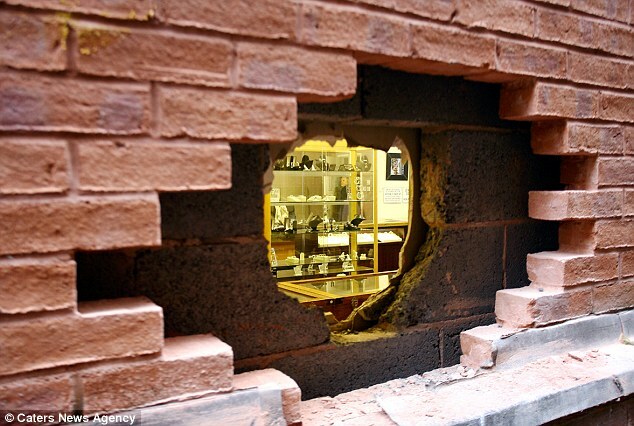 He chipped away at the wall in Nottingham city centre removing around 40 bricks until he had carved out a hole big enough to crawl through and enter the store. 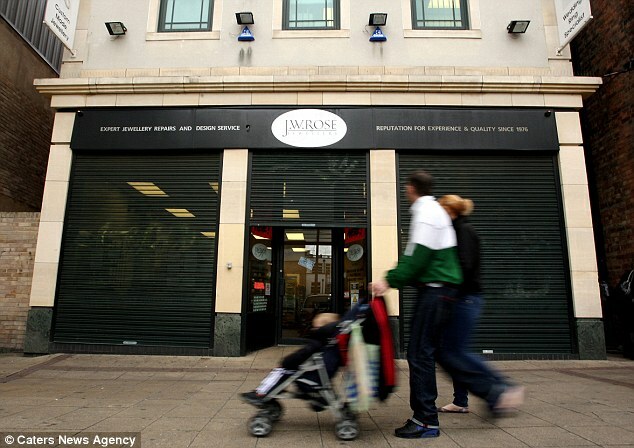 The masked raider was seen on CCTV arriving at JW Rose jewellers at 3am on Tuesday morning before he sat down, pulled out a hammer and crowbar, and set to work on the wall. Astonishingly, he wasn’t disturbed during the three hours he was bashing away with a hammer and crowbar. By 6am he had created a 14in hole which was wide enough for him to crawl into the store. He then spent just four minutes inside, grabbing around 300 items, mostly bracelets, worth almost £30,000. Liz Roye, owner of the jewellers, said: ‘I received a phone call to say the alarm was going off – when I got there I was greeted by a gaping hole in the wall. ‘He smashed his way through the wall using a hammer and a crowbar, but he wasn’t in the store for very long. ‘He had a good look around and even brought his own carrier bag, which he put everything into. ‘There were items in the window, which he got, and other items in the store. The rest was in the safe, which he couldn’t get into. All CCTV images have been passed on to police. The store is offering a £10,000 reward for help returning the jewellery and convicting the offender. Next For US Tealiban/Baptist Fanatics: Destroy Earth to Bring Rapture!